Posted: Sat Dec 19, 15 11:08 am Post subject: Chuffed. I didn't go looking for them, but took a telephoto just in case, & glad I did. 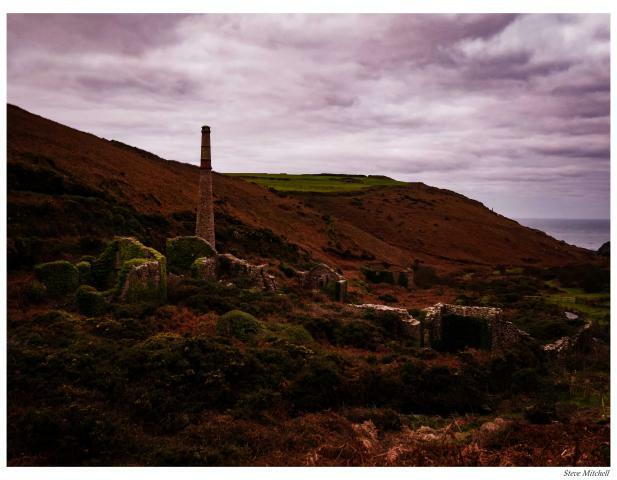 Choughs became extinct in Cornwall in 1973. The last successful mating prior to that was in 1947. The bird sits atop my countries coat of arms & for someone as passionate about his homeland as he is about nature, seeing one stirs my emotions in many ways. With sympathetic land management through use of grazing animals to reduce scrub cover. & ironically also the 2001 foot & mouth outbreak which left the cliffs very deficit in humans, a few returned from Ireland & stayed . One pair bred the following year, & have bred every year since. There are now at least three breeding pairs & over eighty birds resident in the county. 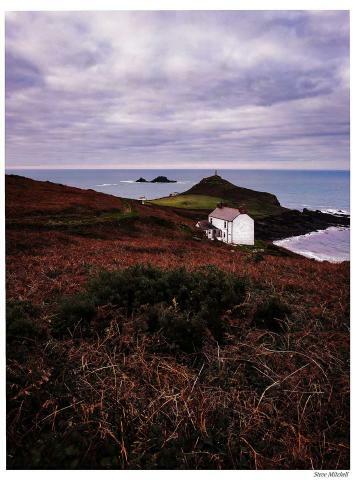 I spent the weekend 'down west' as we say here, on the north coast above St Just on the Penwith peninsula. Primarily to photograph the landscape. On Sunday morning whilst I was packing away my tent I heard their distinctive call & looked up to see seven birds flying overhead. Spent two delightful hours watching & photographing. Light levels where low so photo quality suffered but to see nearly a tenth of Cornwalls chough population in one go has affected me. More about my national bird & its return to its homeland. 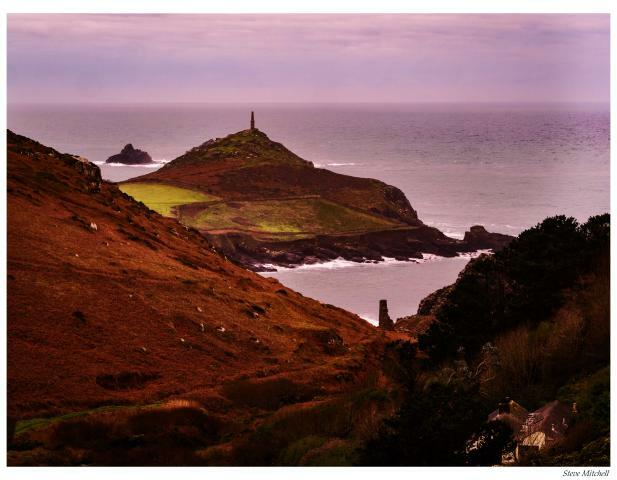 We holiday for one week a year and it's always Cornwall for us, heavenly county. Never seen a chough, but it's on my bucket list. Fantastic. We have them up on South Stack (Anglesey), I hadn't realised they'd gone from Cornwall. I have never seen one and I live right on the North Cornish Boarder . 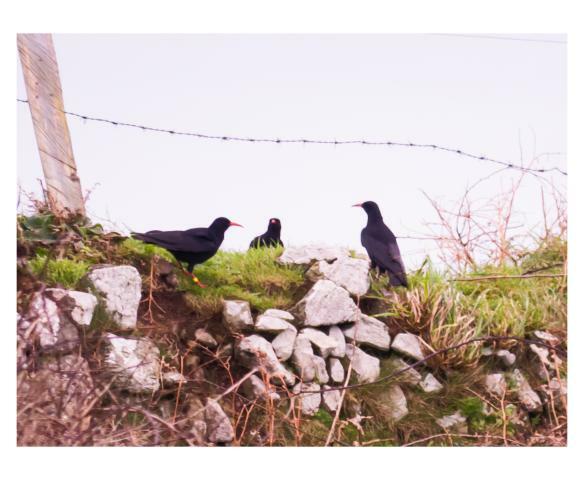 Living where I do, I've become quite blas� about seeing choughs. We see them most times we go for walks on the cliffs and on one memorable day, we had a pair in our fields. You will have more luck seeing them farther West. All of the breeding birds are still on the Penwith peninsula, although you might be lucky & see a visitor from farther north. At least two of the seven I saw where unringed so are either young from a nest not monitored (unlikely) or visitors from the north. I know they are quite common on the Welsh, Irish & Manx coast. They have so much association with my homeland & our past industry. All of the Cornish pairs nest in disused mine shafts. One of the first things taught to me at school was about the bird on the coat of arms & the meaning of the fifteen spots. It would be wonderful if this was because of reintroduction but for it to happen naturally is fantastic. A few months ago I was ready to sell up & ship to foreign shores. This one encounter has made me question that. Really nice pictures, the low light adds to their appeal. 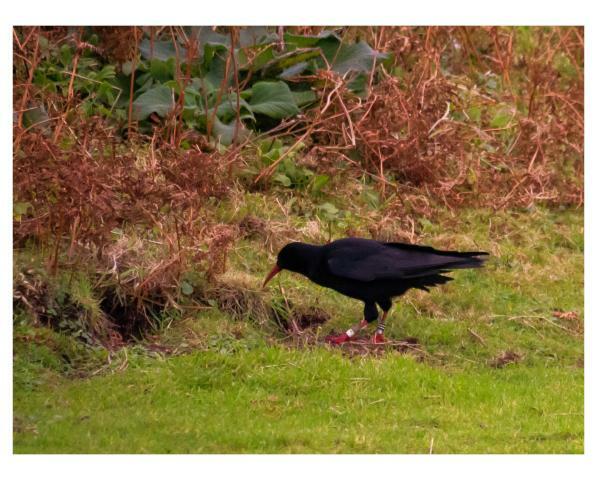 Have seen Chough in Cornwall and Pembrokeshire. Good to hear that they are on the increase. choughs are ace ,i met one in 1987 at porthkernow so im not certain they were "extinct" but tis good to see there are more of them . We get occasional visitors from Ireland & Wales. Resident wise (prior to 2001) the last pair died in 1967 & 1973. The last successful breeding in 1947. All according to the RSPB.